Discover the joy of watercolor sketching in the City of Light! 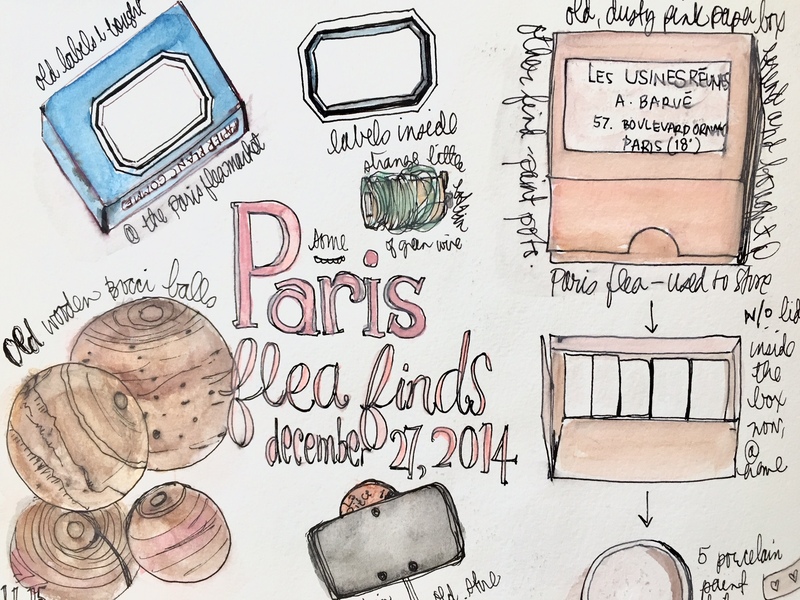 Walk, sketch, paint, and collect your way through Paris. 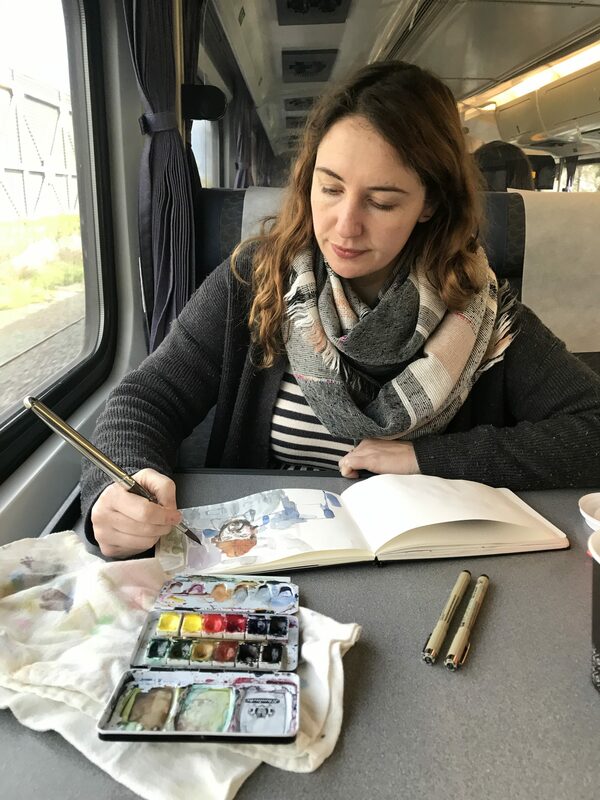 Join artists/teachers Pam Garrison and Courtney Cerruti for 7 nights on our small-group, art workshop in Paris, France. Don’t just visit Paris – experience it. Stroll the Champs-Élysées, sketch on the steps of the Palais Garnier, wonder at the magnificence of Notre Dame. Discover eclectic, unique shops. Take time to sketch on a shady park bench, or sip a glass of wine at a sidewalk cafe. Notice the details and life of beautiful Paris, France as you fill your art travel journal with sketching and watercolor memories. 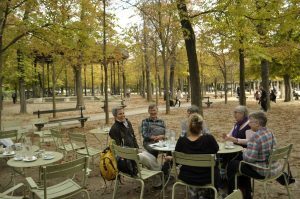 Enjoy leisurely walks, wonderful food, and lighthearted company on our ArtWalk art workshop in Paris. 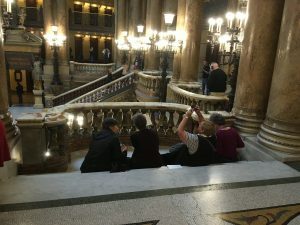 Come along on this uniquely curated tour and art workshop in Paris with Pam Garrison and Courtney Cerruti. The only prerequisite is a desire to have fun and get creative. All types of media will be introduced and encouraged: sketching, ephemera collecting and incorporating, lettering, water-coloring, and more. Pam and Courtney present it all with an eye toward simplicity and techniques that are approachable. You’ll create your own keepsake book, a one of a kind art and travel journal. It is a vivid souvenir of your time spent in Paris, France. 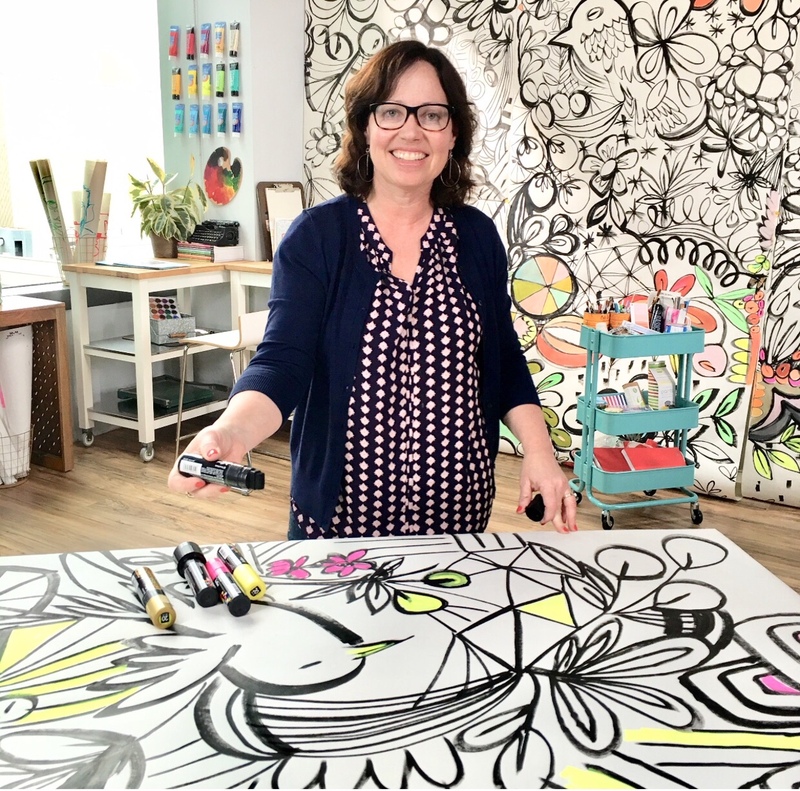 Spontaneous, enlightening, and lighthearted, your most of your travel journal workshop with Pam and Courtney will take place “in the field”, inspired by what you find. Other sessions will be structured class time to make the most of your art workshop vacation. What is an ArtWalk Program? This is an art workshop like no other. Imagine strolling cobbled medieval streets and adorned avenues, pausing on marble steps or in an open air cafe for a lesson on site, and then capturing the essence of each place we visit with the stroke of a brush. 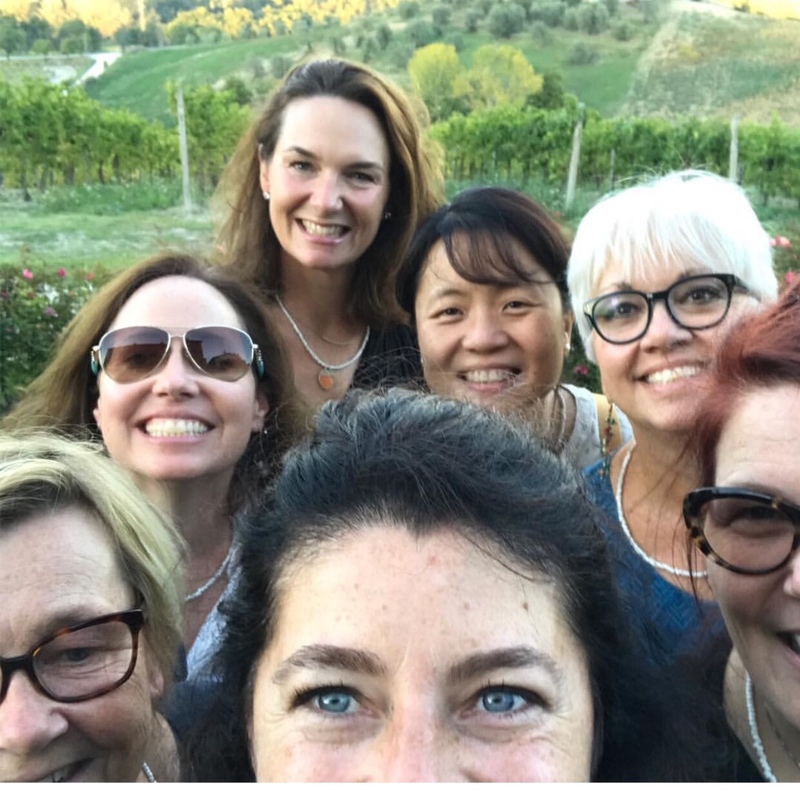 With a small group of fellow artists who quickly become friends, you’ll create small sketches and watercolors uniquely yours, and return home with a travel journal filled with beautiful creations and wonderful memories. 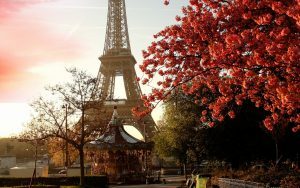 Our art workshop in Paris, France is an artist’s dream vacation. Our 4-star hotel places you in the center of Paris’ artistic heart. We begin with a meet-and-greet and program overview at the hotel. Then we strike out for an orientation walk around the neighborhood and end at our welcome dinner location. Our welcome dinner in a family-owned bistro brings Paris alive with the tastes and scents of french culinary heritage. Under a Parisian sky, you may share a bottle of wine over an abundant table with new friends as you trade stories of travel, life and art. Pam and Courtney are master treasure hunters, so we will definitely visit at least one of Paris’ famous flea markets in search of unique finds – vintage jewelry, paper, linen, and other goodies. For a morning walk, we traverse a few of the many bridges of Paris. We’ll cross Pont Neuf, Pont des Arts, and the (lover’s pad-lock laden) Pont de l’Archevêché as we meander along both sides of the Seine. Later we’ll travel to the posh 9th arrondisement and the Paris Opera House, Palais Garnier. It was made famous as the setting of Gaston Leroux’s The Phantom of the Opera. We’ll admire its Beaux-Arts interior and take time to capture the color and details of this grand style. In addition to beautiful bridges, Paris is known for its array of urban parks offering tranquil respite from the busy urban streets. From our hotel it’s an easy stroll to a cozy pocket of greenery and flowers from which we may sketch and paint Notre Dame. 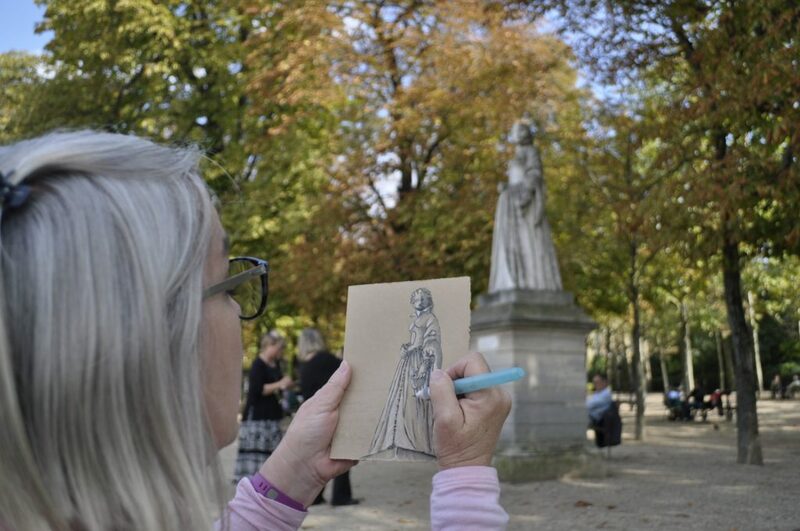 In another direction, our art workshop in Paris may walk to the grand Luxumbourg Palace and Gardens to render a shapely sculpture or stately rows of trees in autumnal hues. We will stroll Paris’ most famous avenue, the Champs-Élysées, through the Place Concord with its towering Egyptian obelisk toward the Louvre. Perhaps we’ll pause in the Tuilerie Gardens for an art class and lunch at one of the open air cafes. Cravings for sweets or chocolate may be appeased with a visit to nearby Angelina’s. What trip to Paris would be complete without a visit to the iconic Eiffel Tower? Even those who have “been there and done that” may take the opportunity to capture the tower’s latticed frames and soaring lines in their sketchbooks. We’ll skip the lines on our way up to the 2nd floor viewing platform to take in the most spectacular views of Paris. The Musée d’Orsay is an art lover’s delight. It holds the world’s largest collection of Impressionist and Post-Impressionist art. We will spend a morning here with the great works of Monet, Degas, Van Gogh, Renoir, Manet, and Cézanne to name but a few. 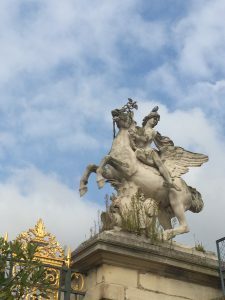 Afterward, and only a short walk away, Le Pont Alexandre III offers its own inspiration. 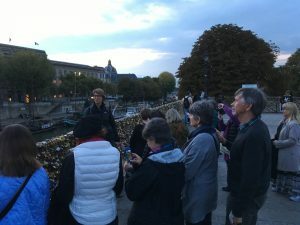 Reaching across the Seine in a single arc and decorated with glowing, gilded sculptures, it is a favorite destination for our art workshop in Paris. Daily guided walks to discover Paris.